Night Sketching está de volta a Portugal depois de iniciarmos a tour europeia por Barcelona, seguido da viagem a Riga. A Vila de Óbidos será o magnifico cenário que nos irá acolher em mais uma noite de desenhos. Inserido no Festival Latitudes e com o patrocinio da Posca Portugal , todos os participantes irão receber uma Posca PCF-350 Branca e ainda se habilitam a prémios POSCA no nosso habitual sorteio final. 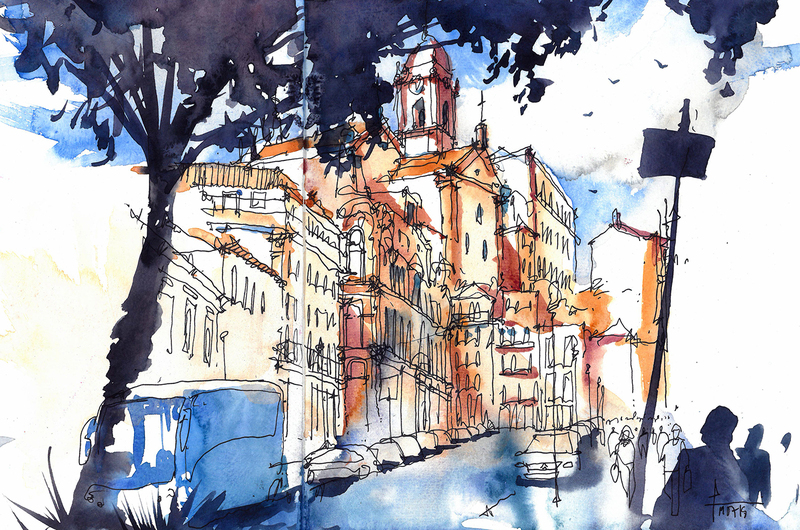 Night Sketching is back in Portugal after we started our European tour! Medieval town of Óbidos is the perfect setting for one more night full of sketches. Sponsored by POSCA Portugal, all participants get a free PCF-350 white Posca pen and could win more POSCA prizes in our usual final raffle. Ready, set, go! Our Riga adventure begins! At 16:30 on the 18th January, me and my family board the AirBaltic flight from Lisbon to Riga in Latvia, for a two-day sketching course with Pedro Loureiro on an invitation by Urban Sketchers Riga. Pedro L. was already in town and we were on our way to meet our friends there. 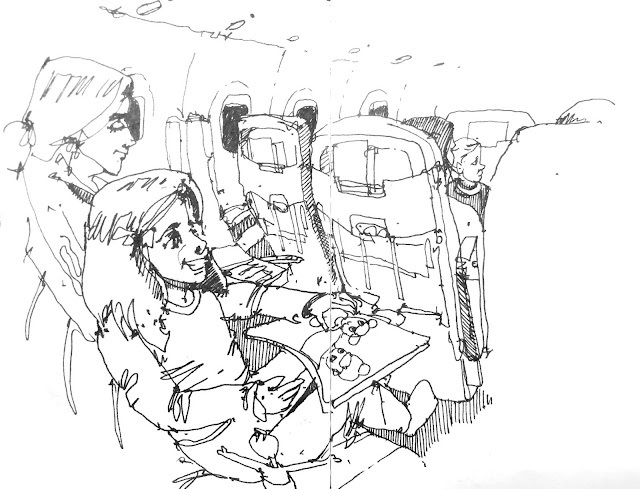 My 6 year old daughter Lia was most excited for being on a plane on her way to a land covered in snow! ...and snow we had! Riga was colder than what we were used to in Portugal, but it was a good to endure and the white landscape with blue and violet shadows were totally worth it. The canal separating old town from the most recent part, was completely frozen, something I've never seen before. 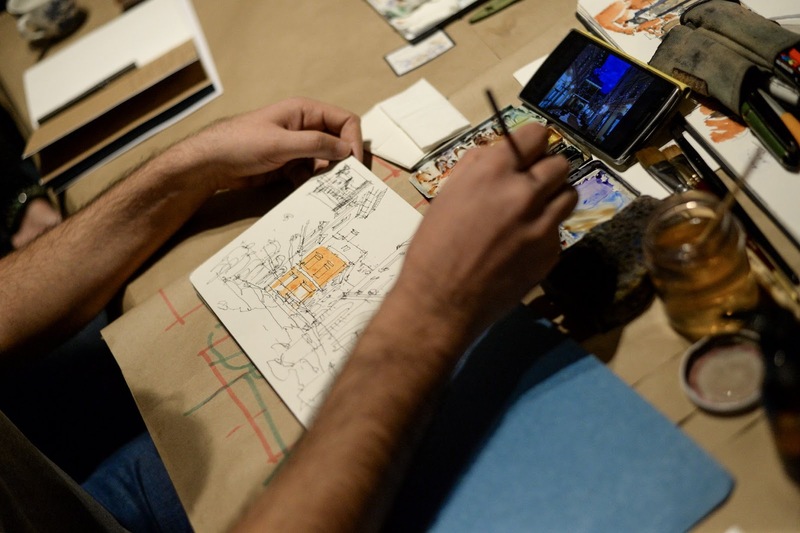 Later in the evening, time to start the workshops with our usual Night Sketching. We had to improvise a bit because the extreme cold had us doing most of the activities indoors. We had an art gallery just for us, with hot coffee and tea to counter the -5º outside. Here, I was showing a bit of our work, to explain that with time and practice, these are the results everyone can accomplish. I took a bit of my hometown Torres Vedras with me, while explaining the importance of lighting on these situations. After that, everyone grabbed their coats and scarfs and went outside because it wouldn't be urban sketching if we were only sketching indoors. Pedro Loureiro usually is the only active "Pedro" at this stage, but (once again we had to improvise) not enough for 30 people to watch, so I had to interviene and by splitting the group in two, it was much easier for everyone to get what we were teaching. We were able to endure about 15 minutes in the cold sketching without gloves... after that we went inside once again to restore our heat levels. Since we had two sketches from the previous demo, we improvised once more and we exchanged sketches for the color stage. Pedro L. (in the picture) painted my sketch and vice versa. 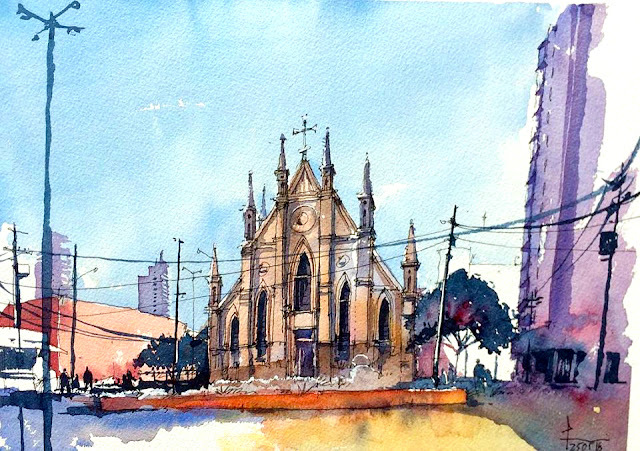 We chose to take much more time in this part to address the beginner sketchers in the class. We took a photo and used it as a reference for our work and explained the this is a common practice when dealing with extreme weather and time shortage, the main constraints of a consistent dose of daily sketching. Soon after, the session was over and everyone seemed very happy, and so did we. the results were fantastic and to celebrate, we went for a beer in a pub nearby. 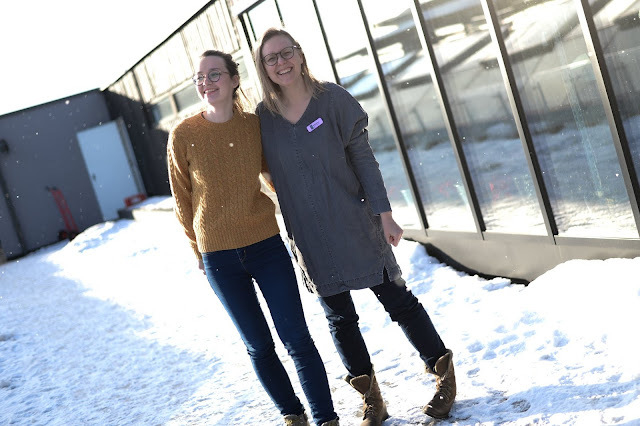 Next Morning we went to the terrace of Shopping Riga to a very cozy coffeeshop in a greenhouse overlooking the city. 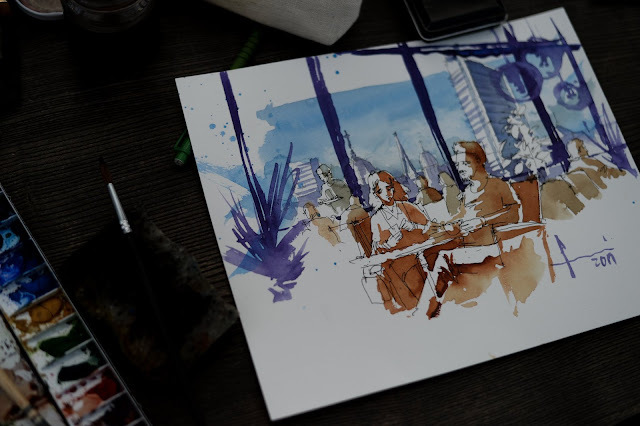 This session was all about reportage sketching and how to create a story with simple sketches. The focus was on the human figure and to include it in our sketches. 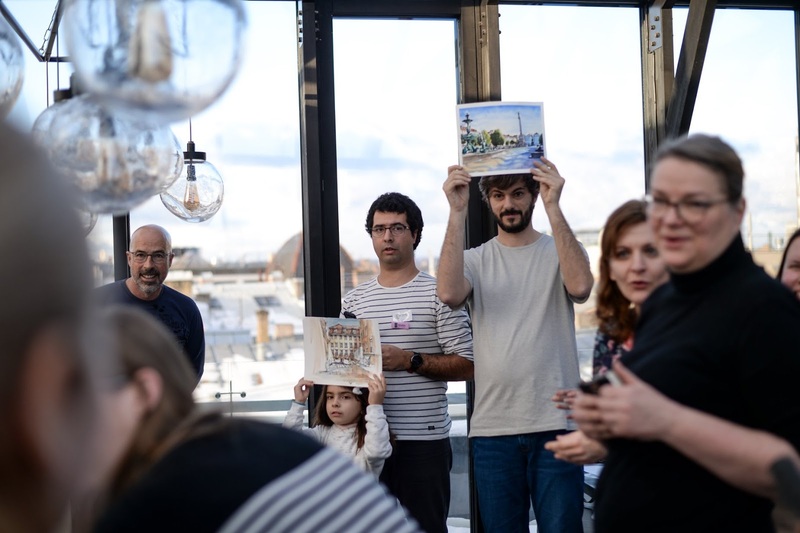 As usual in our workshops, we end with a raffle, where two participants can walk away with one of our sketches. A huge thanks to all participants in the most international Winter School ever! Latvian, Russian, Estonian, French and even Portuguese participants were present in an event I'll never forget. ...and a HUGE thanks for the duo that make all this possible. Our gratitude to Masha and Agnese for the invitation and all the support we had. We felt at home, away from our home! I'm waiting to sketch with you here in Portugal! Meanwhile, we had some free time to explore the city and what it had to offer. It's not a big city like other Metropolis I've been, and I was glad about it. Since I live in a small city as well, Riga seemed quite familiar sometimes, mainly due to the short walking distance between places to visit. The park near the canal acts like a frontier between old and "not so old" Riga, and all covered in snow, is truly wonderful, especially for 6-year old kids dreaming on making snowmen. It took a bit of courage from me to get to the top of St. Peters basilica and sketch. Fear of heights, extreme cold, wind all contributed to the constant fear that I could fall down in any minute... Still, some of the best views of the city are here. The contrast New-Old is astonishing and the sleek design bridge over a frozen Daugava river fits perfectly on the landscape. The Livu square is one of the most iconic in this World Heritage city centre by UNESCO. The snow covered floor and rooftops turned this bit of city very appealing. Riga was cozy, picturesque and as soon as we walked into the old quarter, I felt I was truly in the presence of a multicultural European capital. The Riga Dom, city's main church was being repaired at the time, but it's "verticality" and it's interiors were no less than impressive. To end this Latvian adventure, the crown jewel of Riga's historical centre, The house of the Blackheads, and old guild for unmarried merchants, shipowners and foreigners. The original building was almost razed to the ground by the Germans in WWII and was completely rebuilt in the end of 20th century to it's former glory. 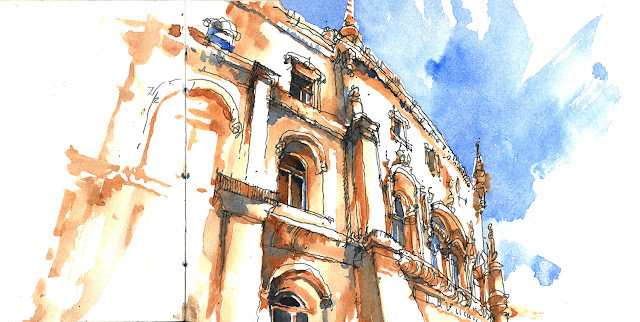 It's a wonder and a challenge to sketch this masterpiece of Baltic architecture. Urban Sketchers Riga have been organizing a sketching school in their hometown every six months for the past two years, always with guest artists and instructors from abroad. Pedro Loureiro and I were thrilled to have been invited as instructors for the 2019 Winter School, on January 18th-20th! 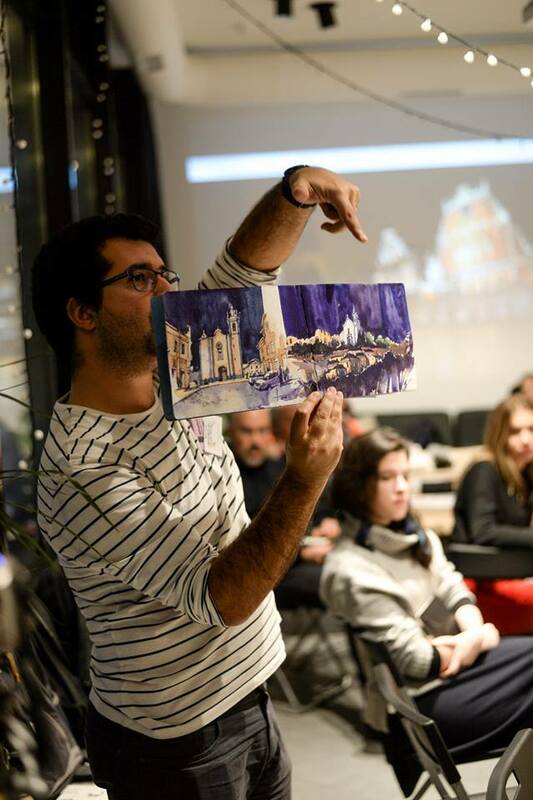 We’re taking our Night Sketching workshop (January 19th) and our Watercolor Storytelling workshop (January 20th) to the Latvian capital. There are still spots available! 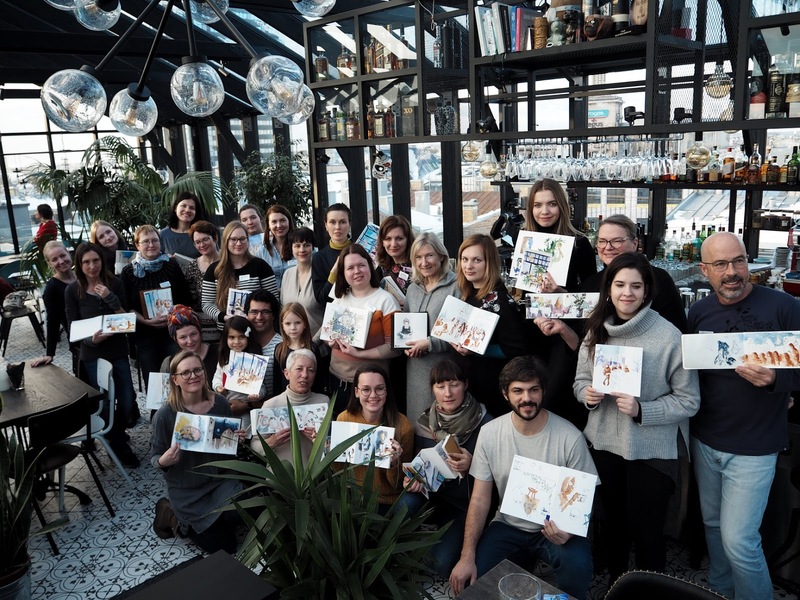 Register in Urban Sketching Winter School Riga 2019. This event and our workshops will be sponsored by our friends in Lithuania, the sketchbook brand SM.LT. Os Urban Sketchers Riga tem organizado uma escola de desenho na sua cidade a cada seis meses durante os últimos dois anos, sempre com artistas e formadores estrangeiros convidados. O Pedro Loureiro e eu ficámos felizes ao receber o convite para conduzirmos uma oficina na Escola de Inverno de 2019, entre 18 e 20 de Janeiro! 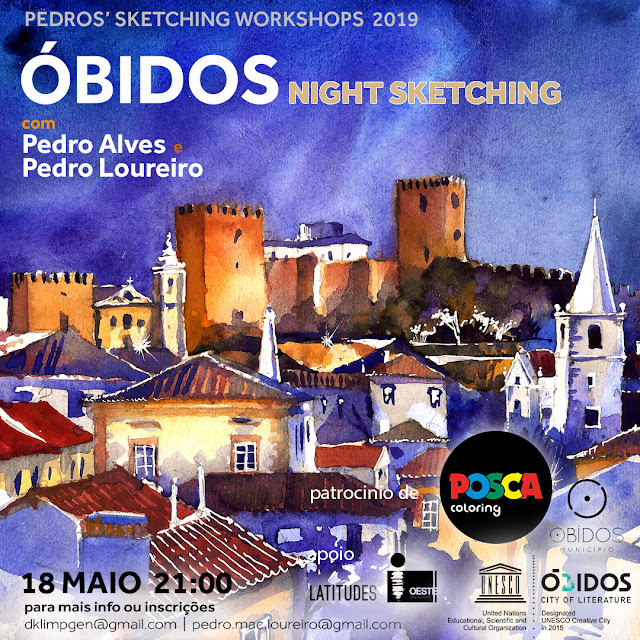 Vamos levar as nossas oficinas de Night Sketching (19 de Janeiro) e de Watercolor Storytelling (20 de Janeiro) à capital Letã. Ainda há lugares disponíveis! Inscrições em Urban Sketching Winter School Riga 2019. O simpósio tinha terminado mas o Porto ainda tinha muito para nos dar e como tal, reunimos um grupo de "vadios" com "oficiais" e lá fomos para a zona da Sé, que ainda não tinha visitado desde que chegara. Aqui fiz um dos meus melhores registos até à data, uma vista estonteante da cidade, confortavelmente apoiado no muro do largo da Sé. Symposium was over but Porto still had a lot to offer to all sketchers still around, so we gathered a small group of "wanderers" and "officials" and off we go to the Sé area, still unexplored by me at the time. Here, I made one of my best sketches to date, a stunning view to the city, standing on the edge of the square. ...and in a flash, it was time to go back to Torres Vedras. Time for a last minute relax with my family and friends, while sketching THE Porto landmark one more time. It was a fantastic symposium, my first and as an instructor nonetheless. I won't make it to Amsterdam due to my work but hope to return in 2020! Sábado era o último dia do Simpósio mas para mim ainda havia trabalho a fazer com um último workshop logo pela manhã. Desta feita, mudei o local para o local original escolhido pela Virgínia, o Jardim da Cordoaria, um pouco mais acima das Virtudes, para não coincidir com o Sketchwalk também à mesma hora. Acabei com nota alta com mais um grupo espectacular! Ainda deu para fazer esta demo para um aluno que chegou mais tarde (obrigado ao Marco Costa que o levou até mim ;) Como o grande amigo Marcelo de Deus estava por ali, convidei-o também a assistir e terminava aqui a minha odisseia de workshops. 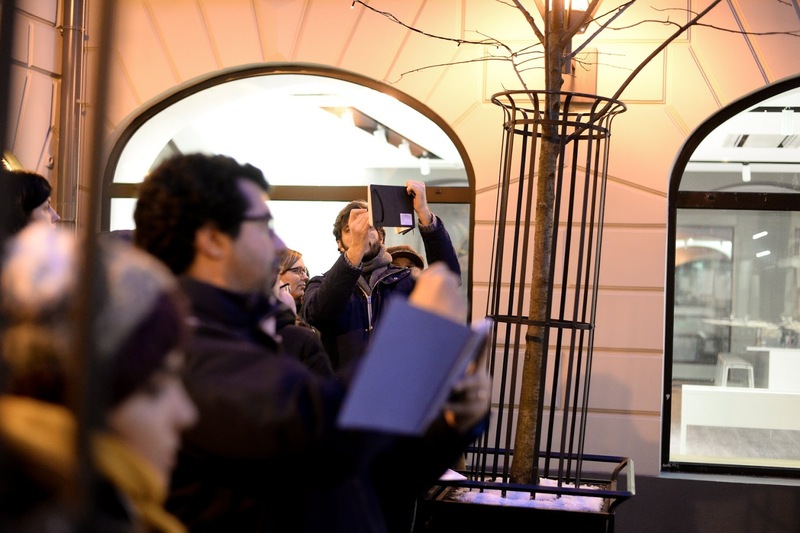 Depois de almoço nas Virtudes, descemos até aos Aliados onde iria acontecer o último Sketchwalk global com todos os participantes. Enquanto falava com o grande Eduardo Bajzek, eu e o Pedro Loureiro íamos fazendo um desenho como nunca se deve fazer... à torreira do Sol! Um escaldão no pescoço depois e lá fomos para junto do edifício da Câmara para a foto final de grupo. After lunch we went down to Aliados Av. where the final Sketchwalk was being held with all the participants. In the crowded streets, while I was talking with the great Eduardo Bajzek, me and Pedro were sketching fast like no one should do... Under de boiling sun! A sunburn in the neck later and we went near the Town Hall for the final group photo. But there was still time for a sketch of this iconic tower that only witness victories from FC Porto in the domestic league. Depois da foto e antes da cerimónia final, eu, o Pedro Loureiro e a amiga Carina Tornkvist (e mais uns sketchers que eu não me lembro ) ainda nos sentámos na Praça de Lisboa no meio da relva para um desenho rápido enquanto descansávamos da subida e do Sol que se fazia sentir nesta altura. 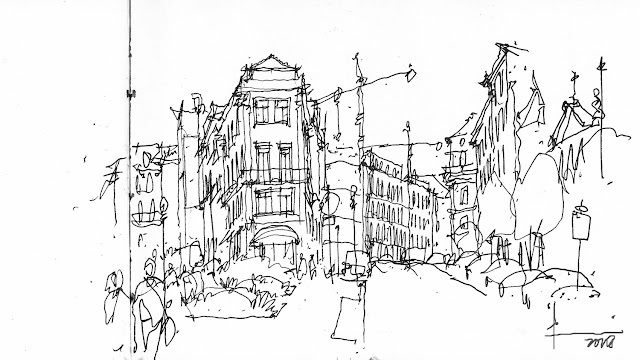 After the famous foto and before the ending cerimony, me, Pedro Loureiro and other sketcher friends, rested on the grass of Praça Lisboa for 10 minutes, and we made another sketch. A sexta feira foi o dia mais longo, com workshops de manhã e à tarde e com apenas 4 horas de sono, estava receoso para com os meus "alunos" e com algum medo de não corresponder às expectativas porque no fundo, todos eles se inscreveram no workshop da Virginia Hein, não no meu... Trepámos as colinas do Porto até ao Passeio das Virtudes e comecei a minha odisseia de workshops. Depois de muitos pedidos de desculpa em nome do povo português por construir cidades em sítios escabrosos, 10 minutos volvidos e já todos nos sentíamos em casa. Após a minha demo, o grupo foi fantástico e respondeu de uma forma exemplar aos exercícios propostos. Friday was the longest day with workshops from dusk to dawn and with only 4 hour sleep, I was a bit afraid for my "students" to be somewhat disappointed if somehow I fail to meet their expectations. They were registered in Virginia's workshop after all, not mine... 10 minutes into it and we're all feeling at home. After my demo, all participants did a fantastic job, and executed all exercises brilliantly! À tarde, mais do mesmo... Mais um grupo fenomenal e uma tarde muito divertida e bem passada a desenhar (eu a andar de um lado para o outro feito louco). Achei interessante publicar ambos os resultados da minha demo para verem como a mudança da luz altera um desenho do mesmo local, quase por completo. De repente a fachada que outrora estava com a luz total, perde força e detalhe quando se encontra à sombra. In the afternoon period, more of the same... Another fantastic group and a very laid back and funny sketching session. I thought it was most interesting to publish both sketches from the same place so we can see how light can drastically change a drawing. The facade that once was in full light, looses detail and character in the shade. Cheguei ao Porto já bem mais tarde que o previsto mas ainda a tempo de saborear tudo e mais alguma coisa do que estava para vir. Depois do check in na Alfândega e de ver que o meu local para a Demo ficava no topo de uma subida tramada, fui testar o local compatível mais plano possível. I arrived Porto much later than expected but still on time to savor everything this Symposium had to offer. After checking in at our HQ in Alfândega, I just saw that the spot for my demo was way up the hill so I quickly went to test something in a more accessible spot. ...and at 5pm we were at Praça do Infante, next to the market, for my Demo, where I was about to explain everything about my proposal and how I usually work, from materials, colours, techniques and errors and how to deal with them, but most of all, the most important rule: have fun while sketching. The demo that should last one hour, took me two because I kept talking and talking and the fantastic group kept asking me questions that turned this demo into a nice talk about the best thing in the world: Drawing! 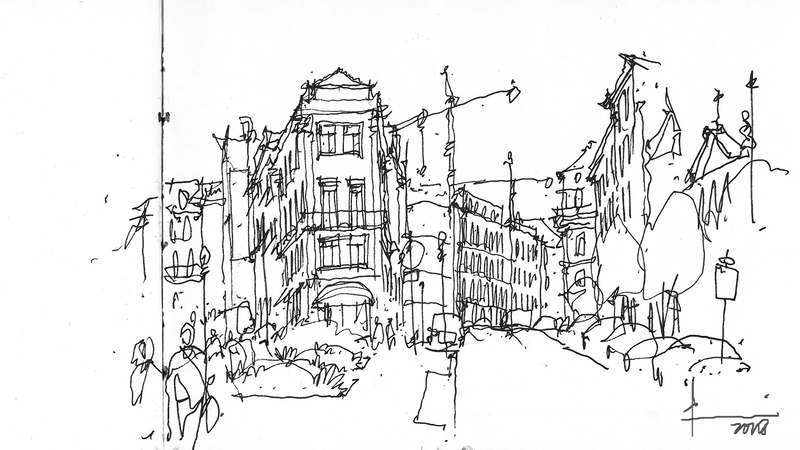 Later in Ribeira Square after meeting the max amount of sketchers I could, time to be among the "wanderers" my sketching friends that don´t miss the annual sketching meeting in Torres Vedras for nothing. Beers kept coming and disapearing in front of me like magic while the sun was slowly setting over Vila Nova de Gaia, perfect for a sketch! The most waited event of the year was coming fast and just two weeks before, the USk Educational Committee informs me that my workshop proposal was chosen to replace Virginia Hein that unfortunately couldn't come to Portugal. I read Virginia's proposal a thousand times before adapt mine, and under the motto: Minimal Colour: Maximum Punch, the renewed "Frame your Sketch" was born. Meanwhile, my great friend from Curitiba, Brazil, the great Simon Taylor arrives in Lisbon and before his departure to the city of the moment, we had the chance to talk and remember our adventure in Araraquara, Brazil not too long ago. After lunch, time for a quick sketch in Praça da Figueira, after all, a lunch between sketchers can't end without a proper dessert . Aqui, a minha primeira "oficina" em terras de Vera Cruz contou com um participante... Um, algo completamente inédito e que me marcou bastante, pois foi uma aula privada de desenho para o talentoso Marcelo Okama, professor de BD e Manga em várias escolas do Município. Fica aqui a minha demo e alguns apontamentos rápidos do que ia dizendo ao Marcelo. Aqui, uma aguarela da Igreja de Santa Cruz, que acabou por ser uma demo a tantos que passavam por mim e com curiosidade me perguntavam o que estava a fazer e assim que abria a boca, me perguntavam "você é de onde"? Assim que respondia Portugal, muitos manifestavam o seu desejo de rumar para cá e outros nem sabiam onde era. Uma das pessoas que me abordou, foi um reporter da TV cultura Paulista, a quem dei o contacto do responsável do Grupo USk Araraquara, o Joel Venceslau. Três semanas volvidas, deu em entrevista para o programa cultural da tarde. Nesse mesmo dia, pela noite, o último workshop em Araraquara patrocinado pelo SESC que foi dado no Shopping Lupo, num cenário nocturno. Depois fomos até ao espaço Acarajé com Arte para uma sessão de Drink and Draw, onde comemos Acarajé, uma espécie de salgado oriundo da Bahia regadas com uma das melhores cervejas Brasileiras, a Original. O espaço era exterior e sem iluminação, perfeito para desenhos rápidos sem cor, o desenho pelo desenho apenas, enquanto conversávamos e ouvíamos a música ao vivo. #100 bonecos - É tão difícil desenhar pessoas que não param quietas.